We have just posted a link to tickets for The Kernel Brewery meet and chat type thing (go to our events page for that). Schneider Weiss tap takeover on March 14th with the following beers..
Then on March 19th we have Mark Tranter bringing his Burning Sky with him, which is nice because he's not been here before. Tickets will on sale toward the end of February. Our kitchen board- Jones & Son - off. Twelve Triangles - on. 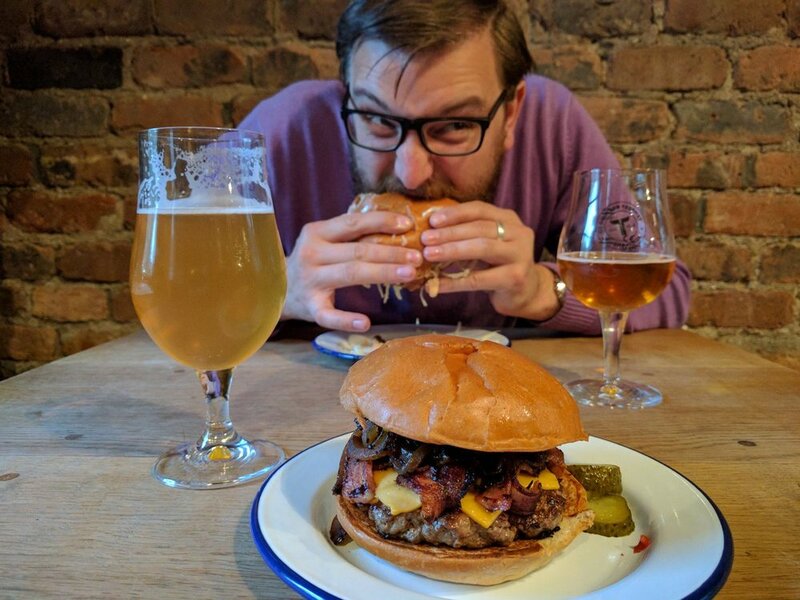 Since early November 2016 we've had the pleasure of serving you the best fries (probably), the best hamburgers (certainly), the best chicken burgers (absolutely definitely) and the best wings (anecdotally) in Edinburgh, courtesy of the absolutely excellent Toby Jones, he of Jones & Son (on twitter, @bespokkeBBQ). Our man Dave, with the best burger in Edinburgh. On May 22nd Toby shall relinquish his grip on our kitchen keys as he moves back to his roots, expect to see a lot more of him out and about during the market season, hopefully not only with the brilliant handmade burgers, but also his unbelievable BBQ pulled pork. On May 24th the kitchen keys will pass to the baker chefs of Twelve Triangles, for food of an entirely different style. Kebabs. Really good kebabs. Trials have been ongoing for a couple of weeks (as those who attended the Rocket Brewing dinner at their Duke Street Kitchen Table last week will testify) and a final menu is imminent. So far the chat has centred around a slow-cooked lamb option, grilled poultry (recipe in development) and house made falafel. All with seasonal salads plus the usual kebaby accompaniments, such as chilli sauce, garlic sauce & pickled green chillis. All made and prepared by the 12T cook team. Oh, and of course all of this will be served on / in sourdough flatbreads. Trial falafel kebab, by Twelve Triangles. Sides will include dukkah / sumac fries, (hand cut fries with a dusting of either dukkah or sumac). In short, it'll be perfect food to pair with great beer, and the delightful Scottish summer we will enjoy. For the other 4 months of the summer, these will taste just as good indoors. From now until May 22nd, get yourself down and scoff as many burgers as you can, and follow @bespokkebbq for updates on where Jones & Son will be popping up next. We need staff. Good staff. Staff who really enjoy beer (not for, you know, breakfast). Job description is below. Salt Horse Beer Shop & Bar is a small, independent, specialist beer bar and shop situated in Edinburgh’s city centre. We are looking for enthusiastic bar staff to join our small team. Previous bar experience is required, although full training will be given. You will be an organised, self-motivated, friendly and hard-working individual, who is able to work quickly and efficiently. You'll work in our bar as well as independently in our shop space.